We are proud to announce that Meadow Walk Homeowners Association has selected Tinnelly Law Group as their associations’ legal counsel. 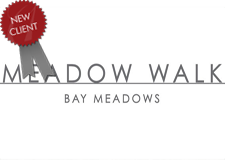 Meadow Walk, by Shea Homes, is a brand new townhome community located within the charming urban village of Bay Meadows, a progressive new urban village on the Caltrain Line in the heart of San Mateo. Built on the famous Bay Meadows Racecourse where Seabiscuit won two stakes in the 1930s, residents will enjoy a community garden, bike paths, parks and more than 18-acres of rambling open space. Our HOA attorneys and staff look forward to working with Meadow Walk’s Board and management.